Henry Dixon began his working life as an apprentice to his elder brother, Thomas, a copperplate printer. He took up photography as a profession before 1860, and operated his own studio until 1886, when his son Thomas James joined him. Dixon, along with Alfred and John Bool, made and printed photographs for a project commissioned by the Society for Photographing Relics of Old London. 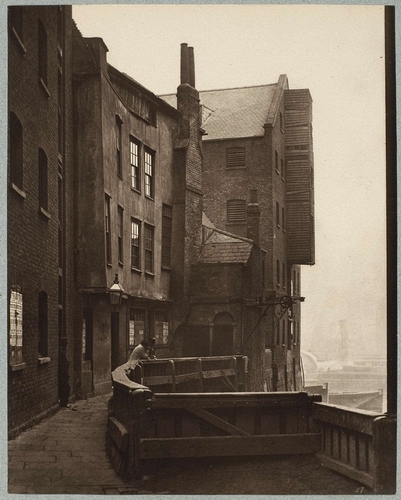 Until the mid-twentieth century, Southwark was filled with wharves and warehouses, a place that had been home to trades associated with ship building and noxious industries such as glass-making, leather tanning, and hat manufacturing that were banned from the City of London. But the borough also housed religious institutions such as the Bishop of Winchester's palace and the church of St. Mary Overy (now Southwark Cathedral).